With a complete wall-mounting system and 12-amp motor, this wet/dry vacuum from Bissell pics up both wet and dry messes in the garage. This vacuum includes seven versatile attachments, a 32-foot long hose and four gallon dirt tank. This vacuum lets you efficiently clean indoor and outdoor areas. Use it to get rid of the dry leaves in your driveway, or clean the unfortunate result of an accident involving ground coffee beans. The vacuum can easily be mounted on a wall in your garage, ensuring accessibility and saving you space. A friend showed this to me he had it in his garage and said he loved it and suggested I get one for my husband, so i checked it out on Overstock.com and decided to order it . I arrived fairly quickly within a few days of ordering, my husband came home hooked it up that night in the garage, all I can say is how did we live without this for so long. It is great , we are so thrilled with it, we love it, friends of ours came over a couple days later saw it and decided they are going to order it. I have wanted a garage vac for a couple of years. After much review and research I decided on the Bissell for a couple reasons. 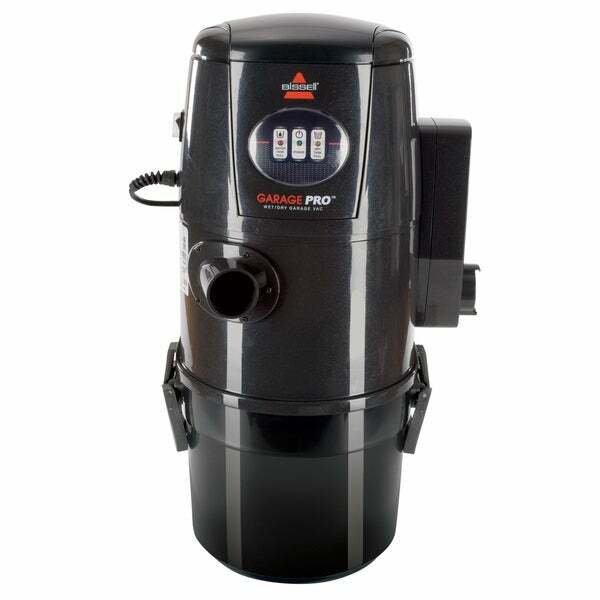 1) Wet/Dry Vac options, 2) reviews, 3) hose length and 4) the 12 amp motor. I am happy to report it is even better then I expected and my Husband was happy as well. Easy installation and a new toy for the garage. We have a 3 car garage he mounted it in the middle and the hose easily reaches all three bays. After he installed it I had to try it out and in less then 30 min I had thoroughly vacuumed out my mini van and his work car which were both in desperate need of detailing. We live in a rural area with lots of dirt and gravel which is lots or mud in spring and winter and it sucked the big chunks and the dust right up. The attachments that come with this are super handy as well and there are lots of them. This vac works like one at the car wash only now I can clean out my vehicles at home in my heated or in the summer air conditioned garage! I would recommend this garage vac to anyone. Thanks Overstock! I did a lot of "shopping around." The Bissell was the the best value, and the best price was clearly at Overstock. The vacuum is light but sturdy. It's very, very easy to install the hanger to hold the machine. When I reversed the hose to blow leaves off my garage floor,however, I was expecting power similar to my leaf blower. Obviously, that was unrealistic. But there was plenty of power to move leaves and debris off the floor and out to the driveway. The suction for other tasks has been more than adequate, and the convenience of just walking over and grabbing the hose to clean up a small mess has been worth the price already. My only beef is with the on/off switch. It's covered with a flexible rubber sheath, probably to keep dust and dirt out of the switch, but it makes it hard to turn on and off!! And that's in the warm weather. When it's very cold out and I have gloves on, there's no way I'm going to turn it on - or off. It's a small issue - overall, the machine has worked great so far. I didn't want to spend a fortune on a garage vacuum cleaner. This is a very fair price for a good - and handy - piece of equipment. Easy to install and works GREAT as a wall mounted garage vacuum. This product is easy to use and get at since it is hanging in the garage. We can clean the garage and the cars without hauling the vacuum cleaner out...recommend this item! The old ShopVac gave up, I checked this vacuum out - "O" had the very best price, bar none. Unpacked the box, all pieces were well packaged. This vacuum is great, really quiet and powerful, not at all like my old one which was powerful and LOUD. Has all the right pieces for working in a car or shop and long hose which can reach to all the corners in a two or three car garage if you place it in the right spot. The only issue some may have with it is the smallish capacity tank. Great vacuum! Great price! I’ve had this for almost 2 years now and it works just as good as the first day I bought it! Time saver and a real convenience with a toddler that makes lots of messes in the car! I love the convenience of this vacuum. I keep my cars very clean and this makes the job so much easier. The hose is very long which is great too. I bought this for my basement and it works well. It will clog easily and so this vacuum is really only good for light dirt and debris. Not meant to be used as a utility vacuum like what I needed it for. We love this vacuum for our garage. We even took it with us when we moved last. Has a very long hose and great suction. So far no issues after almost 5 years. I'd received it yesterday afternoon and I can't wait to waste the time for start to use it. It's easy to assembly, it's work good, only issue is the suction is not strong enough, but I still love it. I had a shop vac in the past and wanted to get another one. we have one now but only lasted one year. "Does this need an outside venting, or does it just mount on any basement wall? What is the noise level if there is no outside vent? Does it have to be mounted, or can it sit on the floor?" Outside venting is not needed. It can mount on the basement wall. The noise level is medium level. It can sit on the floor.